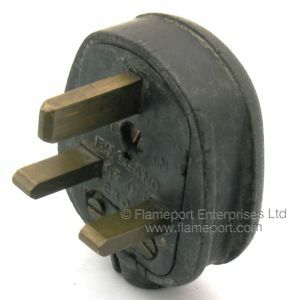 A rather old plug, made from hard black rubber. Pins are unsleeved as with all plugs made at the time. The rubber has substantial cracking around the edges due to age, and the remains of an old label can be seen on the lid. The fuse is missing. Wire colours are moulded next to each terminal - RED, BLACK, GREEN. 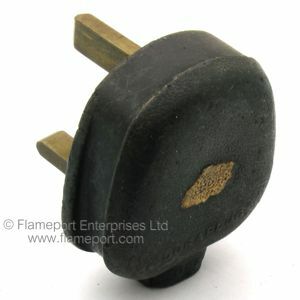 These colours were used before 1971, so this plug is well over 40 years old. 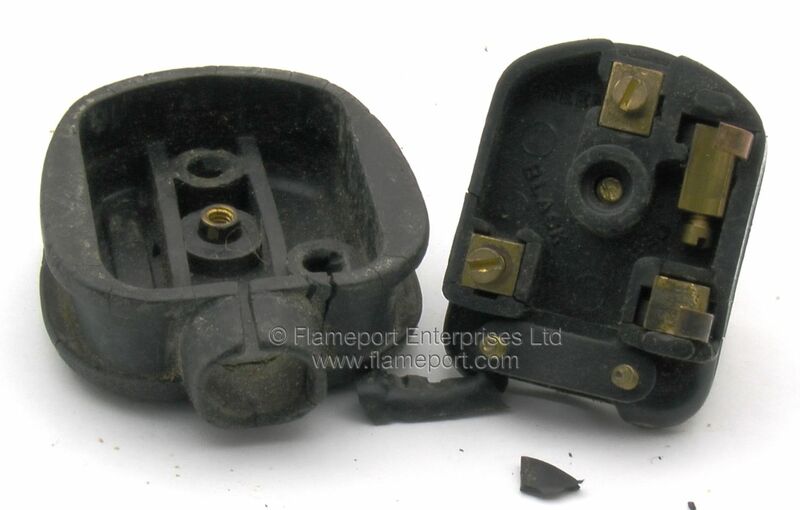 The base containing the terminals is made from a harder material compared to the lid, and a few pieces have broken off near the neutral terminal (left side in this picture). The lid is of the style where the flex has to be passed through the hold before wiring the plug. Someone has obviously forgotten this and therefore sliced through the lid in order to fit the lid over the flex. The flex grip is two flat bars secured with two screws - the flex being held between the two flat bars. 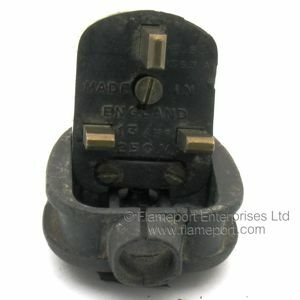 Other text: BS1363A, MADE IN ENGLAND, 13 AMP, 250V. Note that despite the poor condition of the rubber and plastic parts, the solid brass terminals and pins are still in excellent condition with very little wear.